Cortado Flight Mode for BlackBerry | BlackBerry Blast! Cortado has released Cortado Flight Mode for BlackBerry. 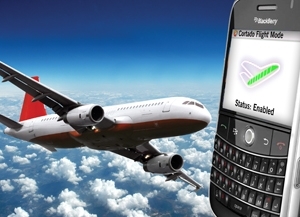 This new app makes it possible to prepare the BlackBerry smartphone for the flight with just one click. Before Flight Mode closes down all wireless connections and turns off the smartphone, incomplete e-mail texts are downloaded from the mail server. Once the BlackBerry smartphone is turned on again after take-off, wireless connections remain disconnected but the user can now use the flight time more productively to read and respond to messages, even if he is offline. "This tool brings an often missed airplane mode feature to BlackBerry smartphones for frequent flyers. It is easy to operate and makes flying time more productive," says Thorsten Hesse, Director of Sales for Cortado and Member of the Management Board. "At some point in time, all business travelers have wanted to read their e-mails on the plane but were prevented from doing so because they were not completely downloaded. This is no longer an issue." Upon landing, all connections can be restored with a single click. Cortado Flight Mode costs USD 2.99 and is available on BlackBerry App World�. For more information please visit www.cortado.com/free.